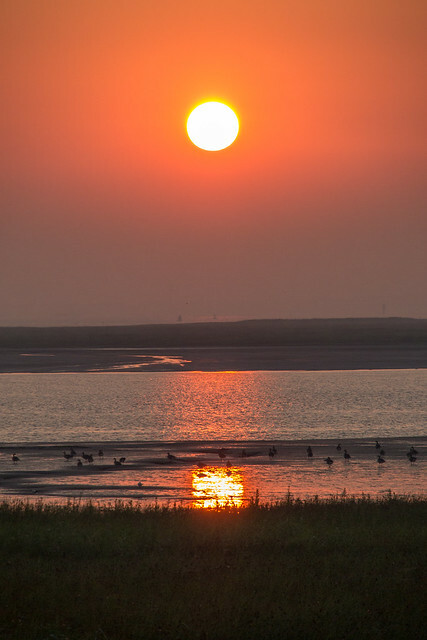 Summer sunrise over the Drowned Land of Saeftinghe. 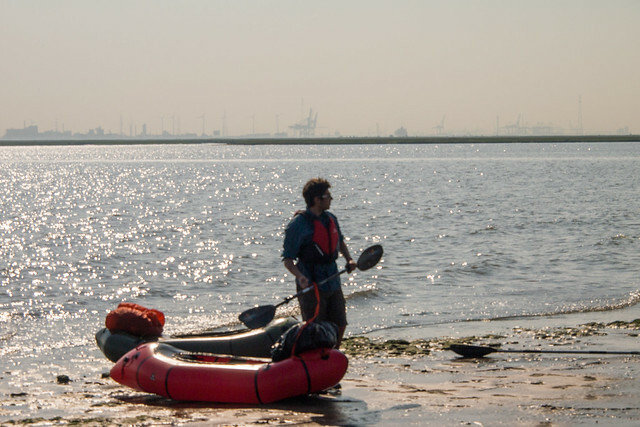 A few days ago Yves and me went to the Western Scheldt estuary to make an interesting packraft day trip. 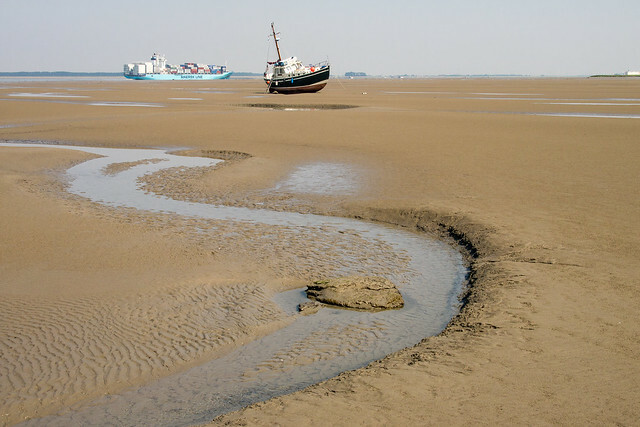 The Western Scheldt is the funnel shaped mouth of the Scheldt river where the sea tides of the Northsea reverse the water flow in the river twice a day, making the water levels rise and drop every time by 6 meters. 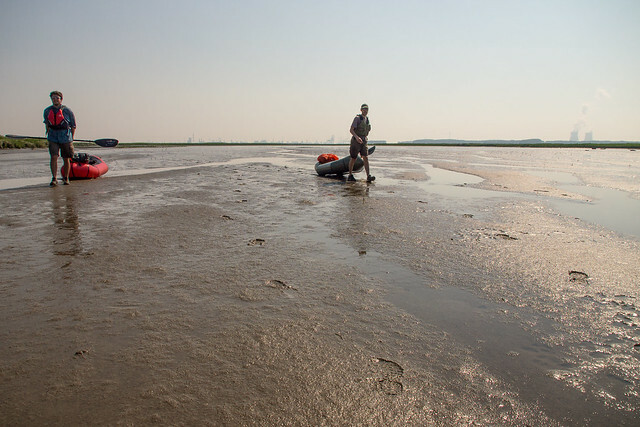 Many sandbars emerge above the water line in the estuary at each low tide and mudflats and salt marshes surround the estuary on many places with the Drowned Land of Saeftinghe being the biggest brackish marsh in Western Europe. 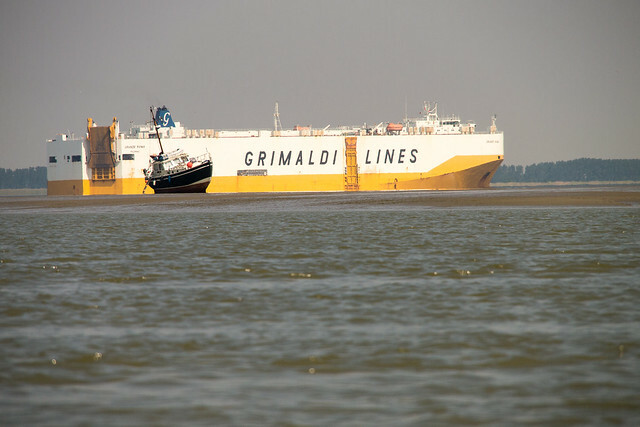 What is more unique is the marine traffic that is continuously taking place through the estuary between the Northsea and the seaport of Antwerp, which is lying 70km inland from the sea as the crow flies. 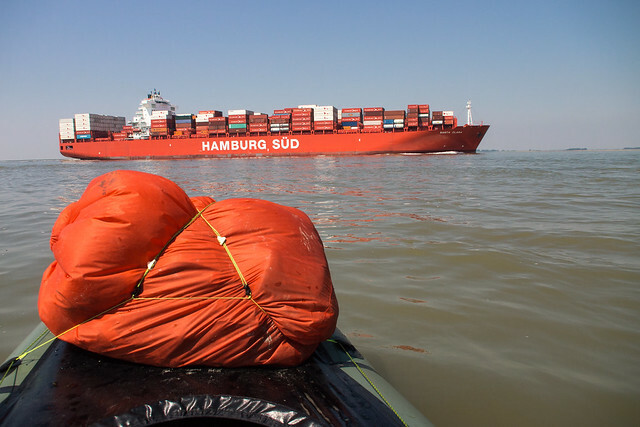 The Western Scheldt is a very interesting packrafting destination but at the same time the most dangerous place to do some flat water packrafting seen the strong tidal currents, all the ships passing by and the winds that can easily blow you away from the shore into the sea lane where the marine ships are passing through and guess what, no they don’t give way for a mortal packrafting soul! The weather forecast promised us weak winds staying ashore and sunny weather with temperatures up to 30 degrees Celsius. Now, don’t stay dally with such circumstances! 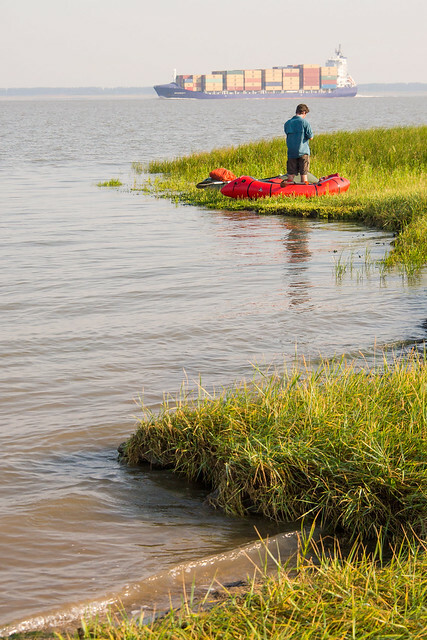 Wednesday evening we headed to the small town of Paal along the southern shore of the estuary and searched a place to spend the night in our bivy bags. That we found on a dyke between the fields. 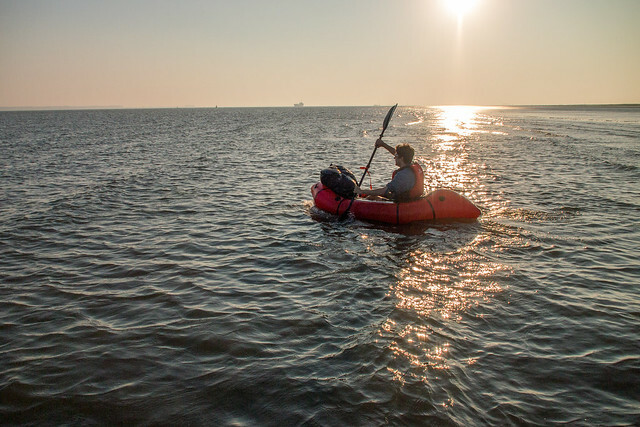 At five o’clock in the morning, the sun even didn’t show up yet at the horizon, we took our stuff and headed for the brackish water. 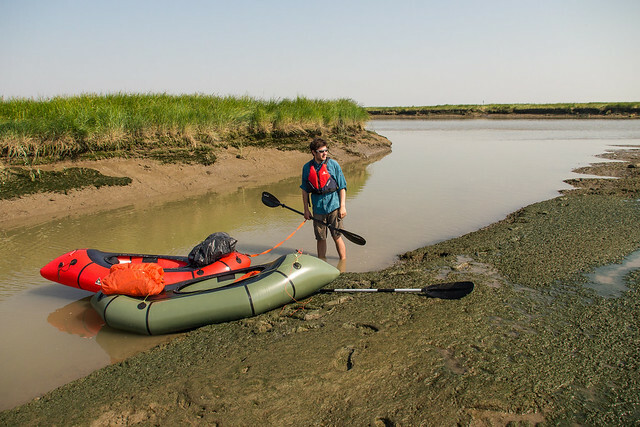 We had to start so early to profit from the current going inland before high tide was reached, otherwise we couldn’t make it to the Drowned Land of Saeftinghe as the currents in the estuary are stronger then the speed one can paddle upstream with a packraft. 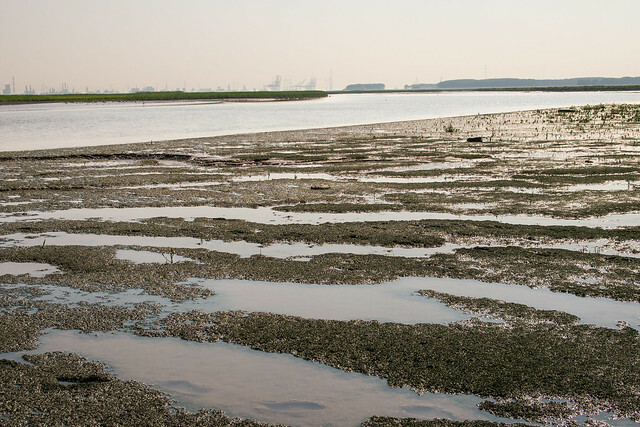 And so we made a nice day trip on the Western Scheldt and through the many creeks of Saeftinghe. The pictures tell the story. Continuing towards Antwerp along the shore with the rising tide after crossing the Speelmansgat creek. Giant marine ships pass through the sea lane. 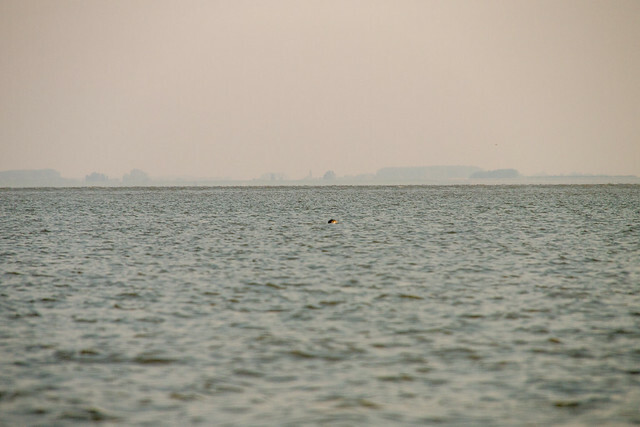 A seal in the distance. Unfortunately I didn’t succeed taking a closer picture even though they came a lot closer than this. We saw about 5 individual seals. Rest stop at high tide after crossing the Ijskeldergat creek. Yet another container ship heading for the seaport of Antwerp. 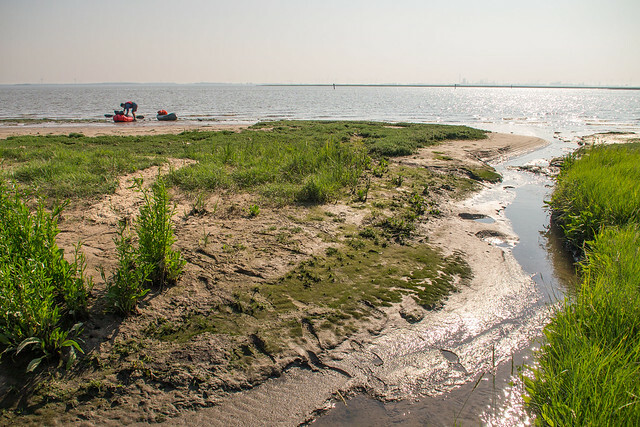 Rest stop at the mouth of the Hondegat creek with the seaport of Antwerp at the horizon. 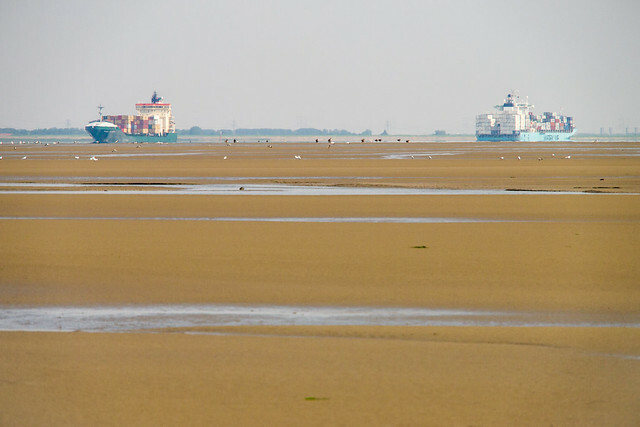 View over the mouth of the Hondegat creek and the bend in the Scheldt bearing the name Nauw van Bath. 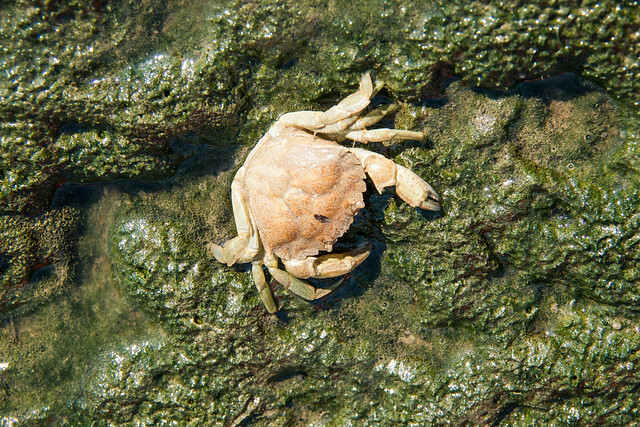 Sea mollusks living in brakkish Saeftinghe. The water levels are dropping quickly and we get stuck in the Van Zandegeul creek. The drowned land is surfacing again. 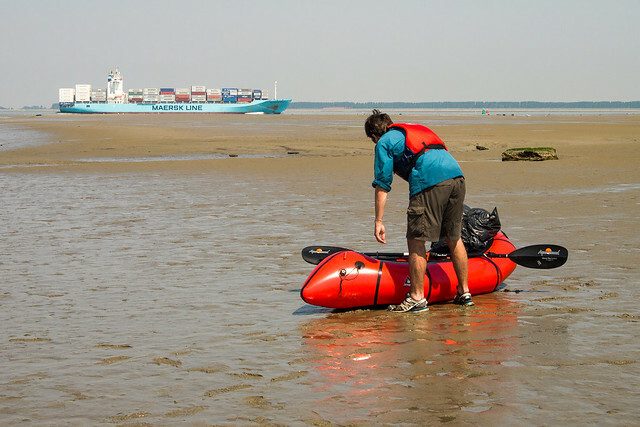 Dragging our packrafts in search for navigable water. The pulling hike takes us to the next shallow creek. 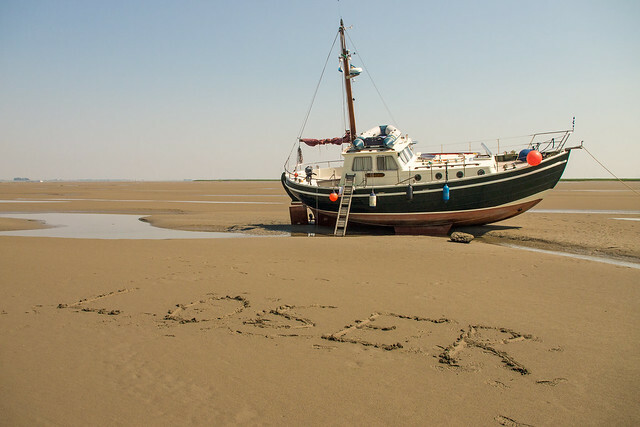 A stranded boat on a sandbar. 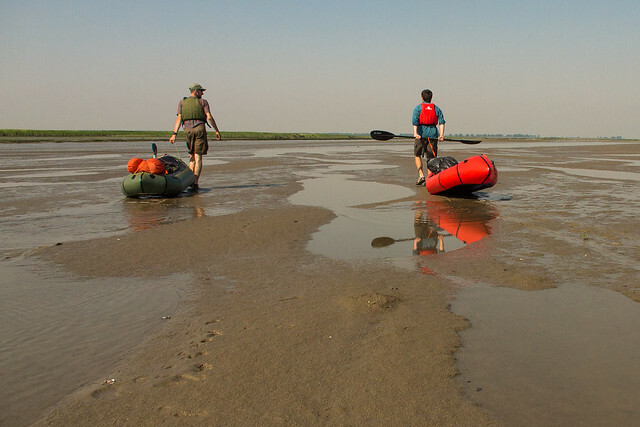 Going ashore on the sandbar. 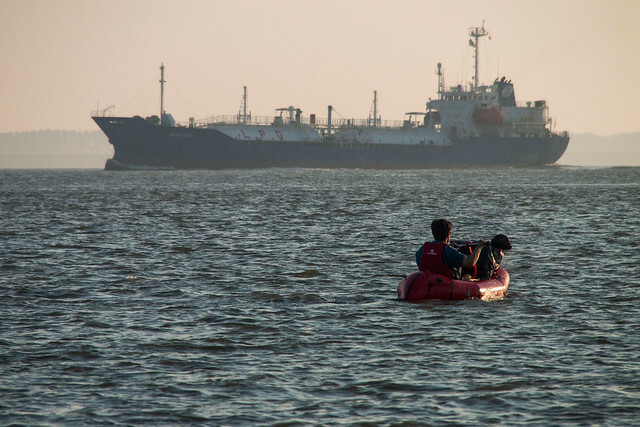 Two people in a stranded boat half a day waiting for next high tide. They even didn’t show up out of their boat. 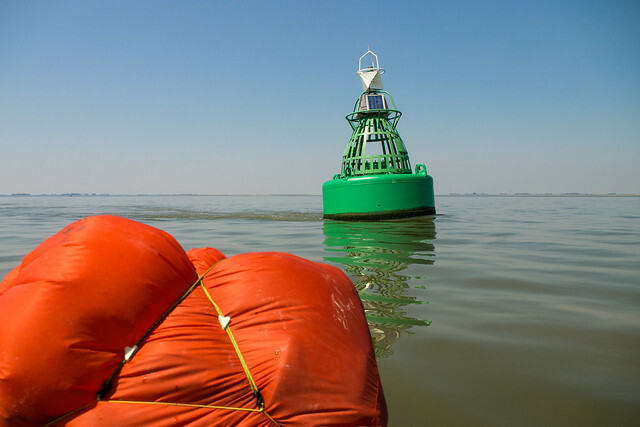 Giant buoys mark the sea lane for the marine ships and lie tilted in the flow between the tides. Briefly playing in the wake of the buoy. 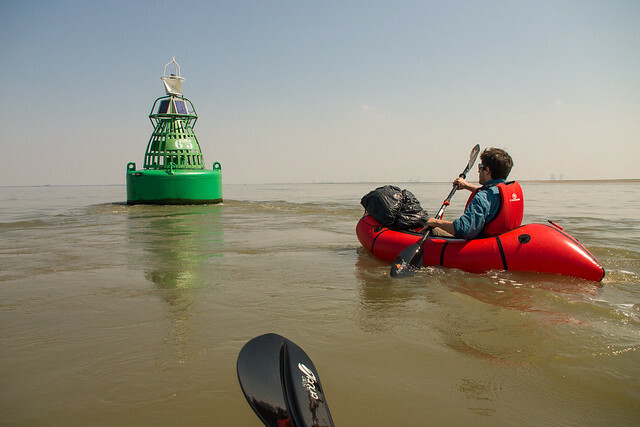 The current is so fast we just drifted away from the buoy no matter how hard we paddled. This giant took us by surprise as about one minute after I took this picture it pulled all the water out of the shallow Speelmansgat creek where we just had arrived and all of a sudden we just were stranded at the bottom of the creek until a wave train with up to 1,5m high waves quickly invaded into the creek again. Luckily we did not capsize but we sure were impressed. After that we stayed playing in the waves with every other ship passing by. At the end of our trip in the shallow Speelmansgat creek. 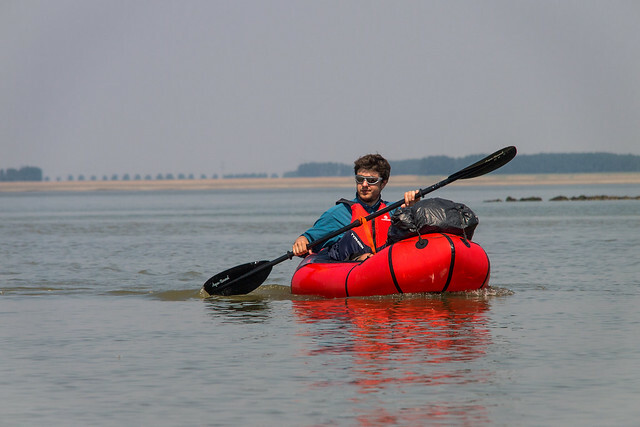 This entry was posted in Day hikes & overnight trips, Packrafting and tagged Alpacka Raft, Drowned Land of Saeftinghe, Packrafting, Schelde, Scheldt, Verdronken Land van Saeftinghe, Western Scheldt, Westerschelde. Bookmark the permalink. Reblogged this on hannaswalk – ok mostly others at the moment. 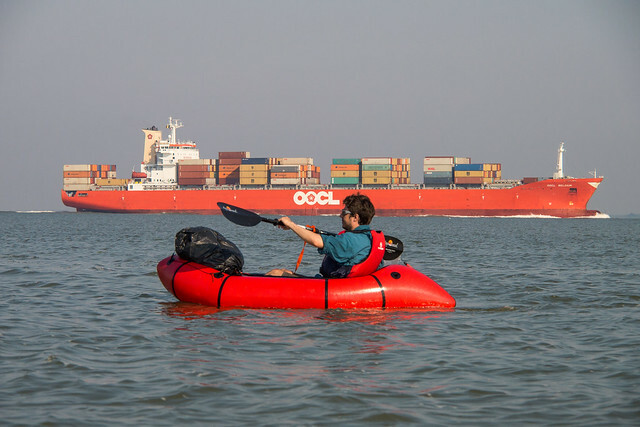 Great photos showing the contrast in the sizes of the boats! I really enjoy seeing Alpackas being used out of their ‘normal’ environments. Great post Joery. Nice trip, but dangerous indeed. What kind of preparations did you make to know the wind and tide was ok? Hmmm… Would you do it over?